Chicken noodle soup has to be one of the great comfort foods on the planet. When I’m sick, it makes me feel way better. Even if it’s all in my head, somehow the steamy broth and flavors of chicken, noodles and veggies help me turn the corner towards wellness. The problem is, when I’m not sick, soup is never enough for me at a meal. I know there are people who are totally satisfied with the soup n’ salad thing. I am not one of those folks. I need something with a bit more substance. Which is why I love this recipe. 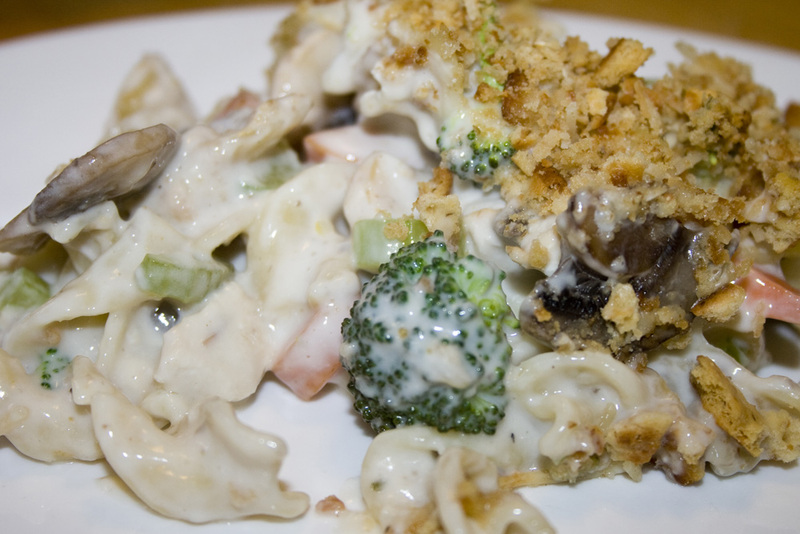 It combines all my favorite comforting soup flavors in a casserole that fills you right up. I’d never poached chicken before. And certainly never used the same water to then boil noodles in, but it worked really well, and made for one less pan to clean after dinner! Less dishes are always a good thing in my book. Feel free to add whatever veggies your family likes in addition to the carrots, celery and onion. Peas would be excellent in this for sure. Lightly saute any veggies in a non-stick skillet about 5 minutes and add to chicken and noodles. In a separate bowl, mix together mushroom soup, milk, and sour cream. Season with salt and pepper. Gently stir together cream soup mixture with the chicken mixture. Place in a 2 quart baking dish. Melt butter in microwave and stir into crumbled crackers & parmesan. Top casserole with the buttery crackers.